Bradenton, Fla. - The Bradenton Marauders today unveiled a commemorative logo to celebrate the 10th season of Marauders baseball in Bradenton. Marauders General Manager Rachelle Madrigal and Pirates Senior Director of Florida & Dominican Republic Operations Jeff Podobnik announced the new artwork at a meeting of the Bradenton Kiwanis Club. The logo, designed by the Pirates and Marauders, features the primary Marty the Marauder logo at the bottom tip of a black diamond with yellow accents. In the middle of the diamond is a large yellow number 10. 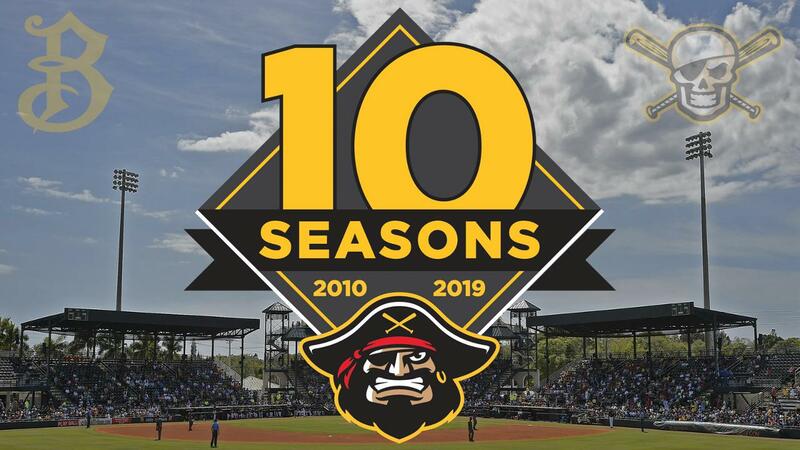 The years 2010 and 2019 are in the diamond in small yellow text, denoting the inaugural season and the 10th season for the team. A dark black ribbon with the word "seasons" printed in bold yellow is placed beneath the 10 and above the years. Merchandise featuring the new logo will be available prior to the start of the 2019 season. The Marauders are planning celebrations of the team's history throughout the season. The Marauders play their home games at LECOM Park, just south of downtown Bradenton. The ball club has qualified for the postseason in four of its first nine seasons, capturing a Florida State League championship in 2016. Other highlights of the team's first nine seasons include bringing the Florida State League All Star Game to Bradenton in 2014 and producing 57 MLB players, an average of more than six per season. 2018 season ticket holders can begin renewing their ticket packages for the 2019 season immediately. Group ticket sales for 2019 are underway as well. Group ticket purchases are available to groups of 10 or more and feature numerous benefits and opportunities that can be customized depending on the interests of the group. New season ticket packages and All-You-Can-Eat five game ticket plans will go on sale on Monday, October 22. Single game tickets will be available starting February 15 at the LECOM Park ticket office, online, and by phone. Bradenton's 2019 home opener is Saturday, April 6, at 6:30 p.m. Bradenton hosts the St. Lucie Mets.